A former Lord’s Resistance Army (LRA) commander, Thomas Kwoyelo, has been charged and committed to the War Crimes Court to face trial. Kwoyelo, 39, appeared before Buganda Road Court Chief Magistrate Vincent Mugabo, who did not allow him to plead to the charges. He becomes the first suspect to be charged with offences relating to war crimes. “This court does not have the jurisdiction to take your plea, it can only explain the offences to you,” Mugabo said. He was charged with 12 counts, which included willful killing, taking hostages, extensive destruction of property and causing serious body harm. The trial date is yet to be set by the War Crime Court. Prosecution led by Principal State Attorney Charles Kaamuli said Kwoyelo in March 1993 commanded an attack on Pagak internally displaced people’s camp in northern Uganda in which several people were killed and others were taken hostage. 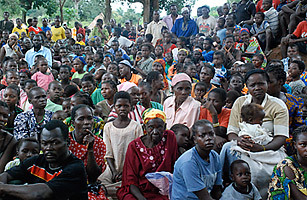 Court also heard that Kwoyelo and his men destroyed property and injured scores of people in 2004 in northern Uganda. He allegedly committed the offences between 1996 and 2009 with others still at large in Gulu, the Democratic Republic of Congo (DRC), and Southern Sudan. Click here (and wait for end of short advert) to hear Ed Robbins reporting for Time.com from Western Equatoria State, southern Sudan. Replay the video again and imagine yourself as Moses. The flat deadened tone of his voice is haunting. After viewing the report for the first time yesterday and working on it today at Uganda Watch, Sudan Watch and Congo Watch, I can't get Moses out of my mind. His trauma seeped into my bones as I imagined how he must have felt, what his future holds, and how he will think and be haunted for the rest of his life. I find this report deeply distressing and disturbing. 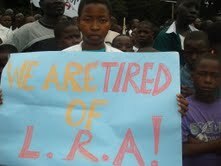 I cannot understand why so many people are powerless when it comes to stopping the LRA. How someone like Joseph Kony manages to stay alive is beyond my comprehension. The stresses and strains he has gone through in his lifetime are unimaginable. A living hell, I guess. 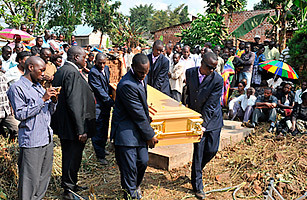 Photo: Mourners bury Alice Kyalimpa, a victim of the July 11, 2010, terrorist attacks that tore through a restaurant and rugby club in Uganda's capital Ronald Kabuubi/Reuters. Source: TIME.com report September 07, 2010 "Balancing Counterterrorism and Democracy in Uganda". To view the report in full, click on the link above. If the report has moved, scroll to the end of this entry to read a full copy. 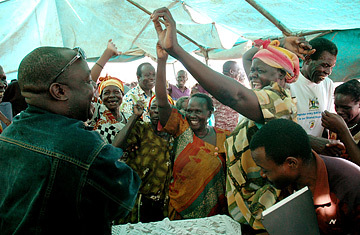 Uganda Watch Editor's Note: A similar version of the above was published earlier today (Wednesday, 08 September 2010) at this blog's parent site, Sudan Watch http://sudanwatch.blogspot.com and will be cross-posted today at its sister site Congo Watch http://congowatch.blogspot.com. The once war-torn northern Uganda has yet again received funds from the United Kingdom as efforts to develop the region intensify. DFID, the UK’s Department for International Development, has offered 16.6 million pounds to rebuild northern Uganda, and lay a strong foundation for business opportunities. Jane Rintoul, the Head of DFID office in Uganda, estimated that the money will create 20,000 jobs, although such estimates tend to be conservative. In trying to resuscitate the business potential of northern Uganda, government, together with DFID and other donors, is deepening a key market for beverage and palm oil companies, among others, which are part of the largest taxpayers. Mukwano Group’s top officials were late last month in Lira and Oyam districts, dangling a Shs 20 billion bait to the farmers if they could double the production of sunflowers. Northern Uganda has virgin lands for the growing of sun flowers, which companies like Mukwano use to produce cooking oil. Other firms making trips to northern Uganda include Nile Breweries Limited, which gets sorghum for the production of beer. British American Tobacco Limited also gets a lot of tobacco from the region. Rintoul explained that grants will directly support the creation of new businesses and the expansion of existing enterprises in agricultural development and trade. This means foreign investors who plan to start doing business in northern Uganda qualify to apply for the DFID grants. The Private Sector Foundation Uganda has a plan on how to take advantage of the funds. Gideon Badagawa, PSFU Executive Director, said they will organize farmers into cooperatives to access the grants. Officials say that under the cooperative initiative, thousands of small scale farmers will benefit from better market access, storage facilities for their produce as well as share knowledge on modern production methods. Through their Business Uganda Development Scheme, a support programme, Badagawa says PSFU will also train farmers and help them add value to their produce before reaching the market. “We’ll use part of the grant to purchase equipment for farmers to add value to their produce, look for markets and impart skills so that farmers can sustain their incomes other than giving handouts,” Badagawa said. While the funds from DFID are to directly benefit the people in northern Uganda, they have a wider implication beyond the country’s borders. Northern Uganda remains the easiest gateway into Southern Sudan, a place almost the size of Uganda with a mineral potential. Businesses, such as construction and retail services, are booming in Southern Sudan after security returned to the area in 2005 following a two-decade insurgence against its neighbour in the north. Southern Sudan is also rich in oil, with companies from China already prospecting the black gold. With Ugandans scouting for foreign markets to sell their products, Southern Sudan presents a larger and more profitable market. Rintoul said DFID has committed another 24 million pounds to construct residential houses for teachers and health workers in the region. At least two million people who returned from the refugee camps in the region at the end of the war are engaged in agricultural activities. They mainly grow simsim, groundnuts, citrus fruits and cotton, whose products need value addition to attract better revenues.